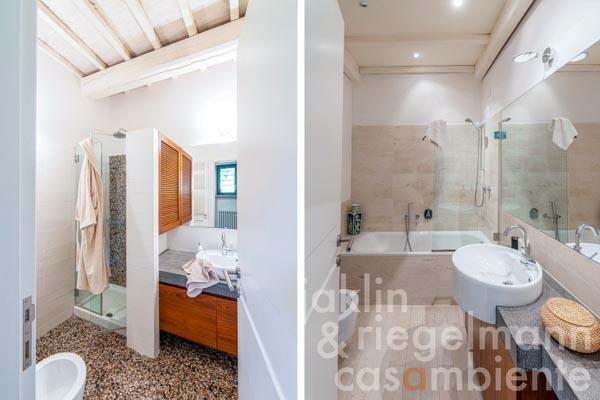 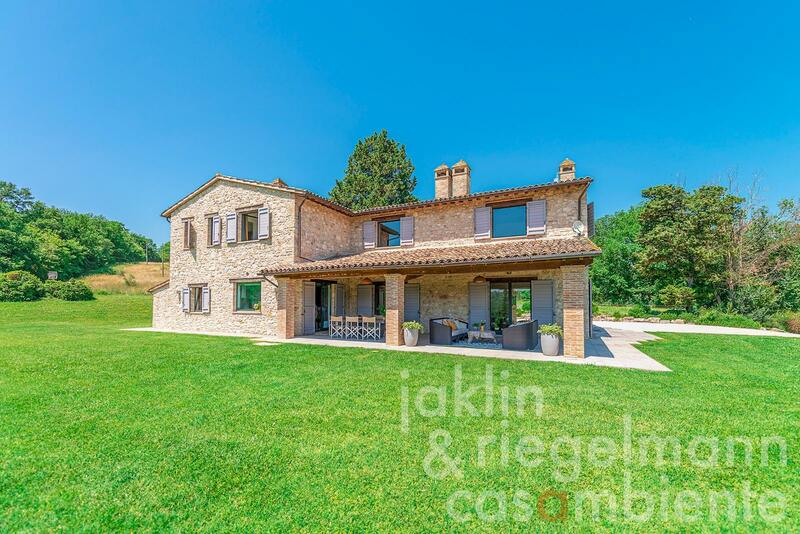 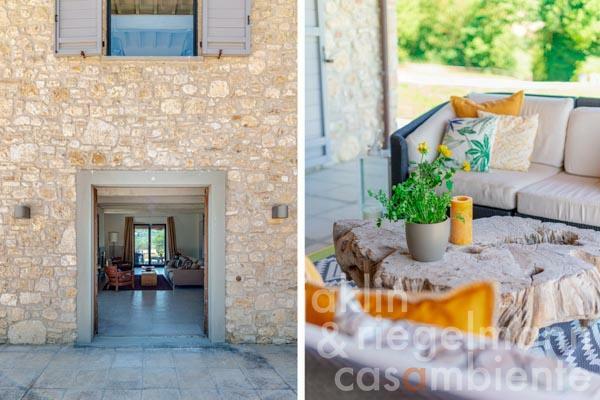 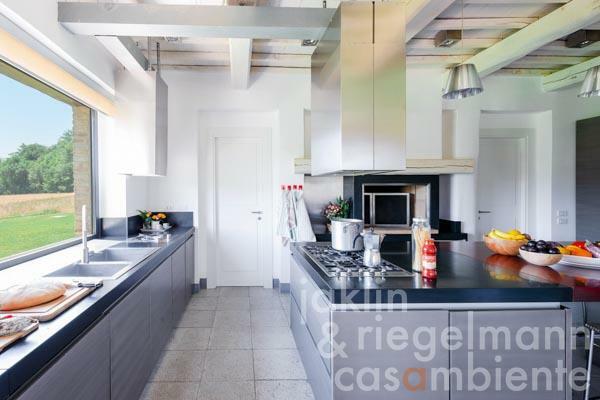 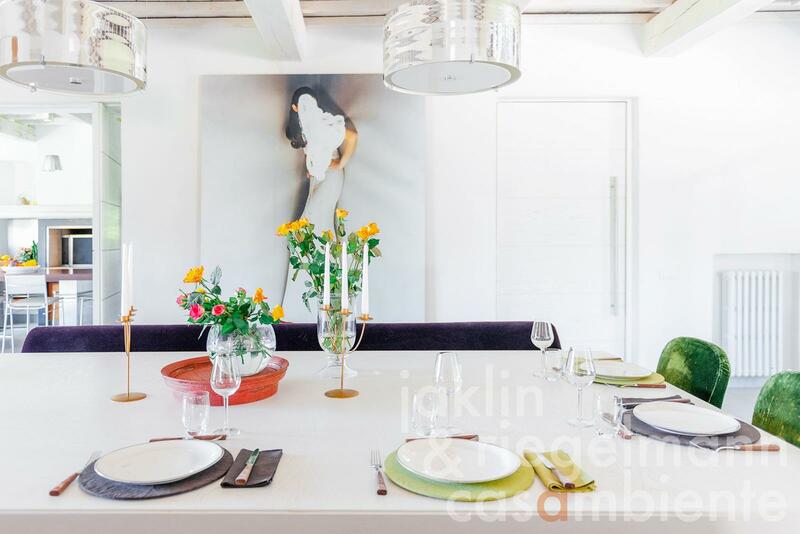 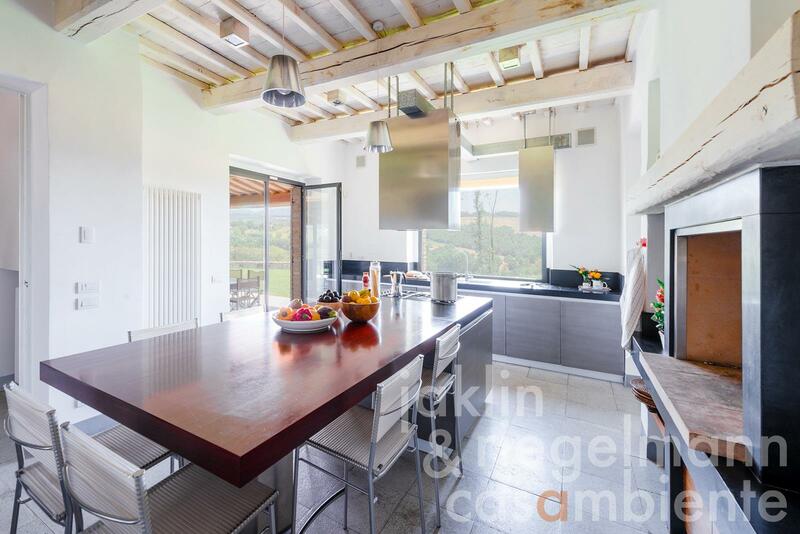 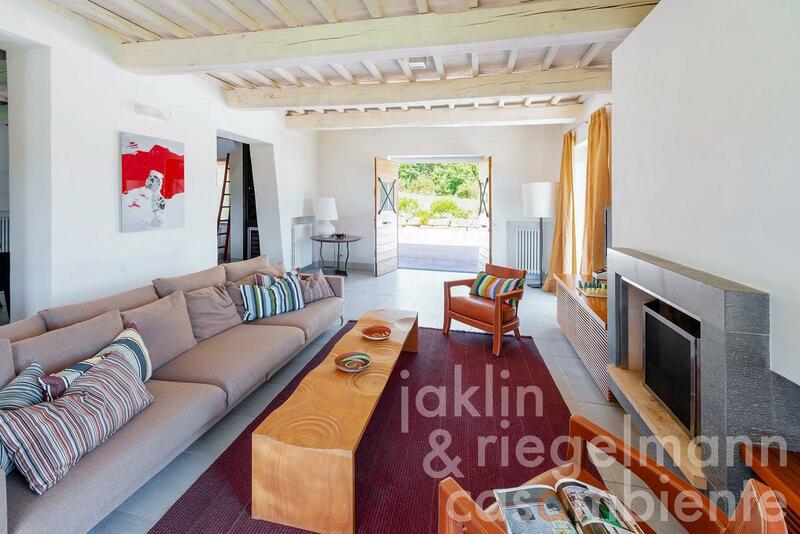 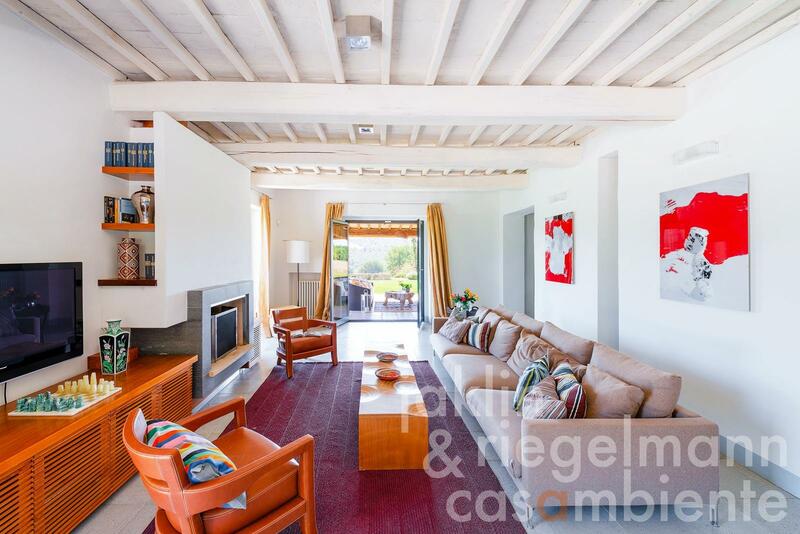 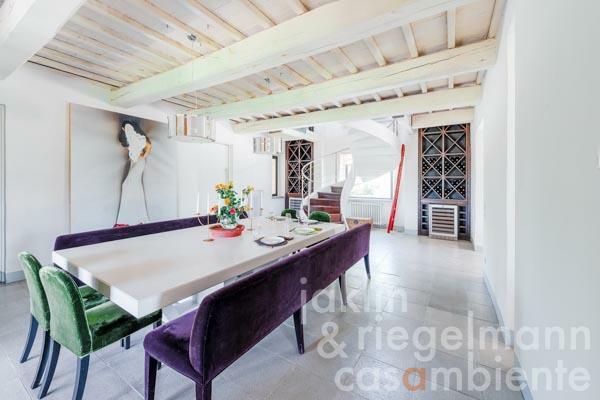 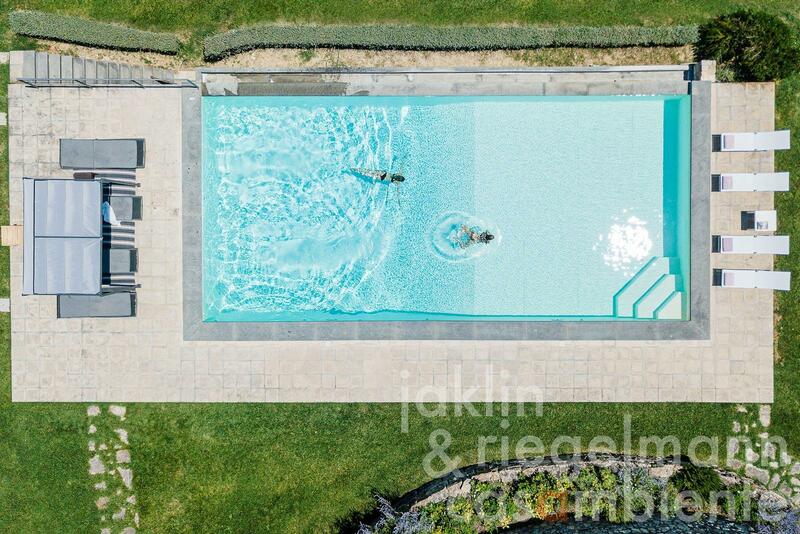 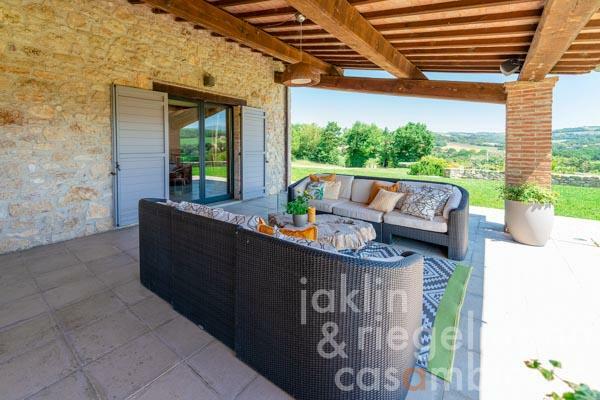 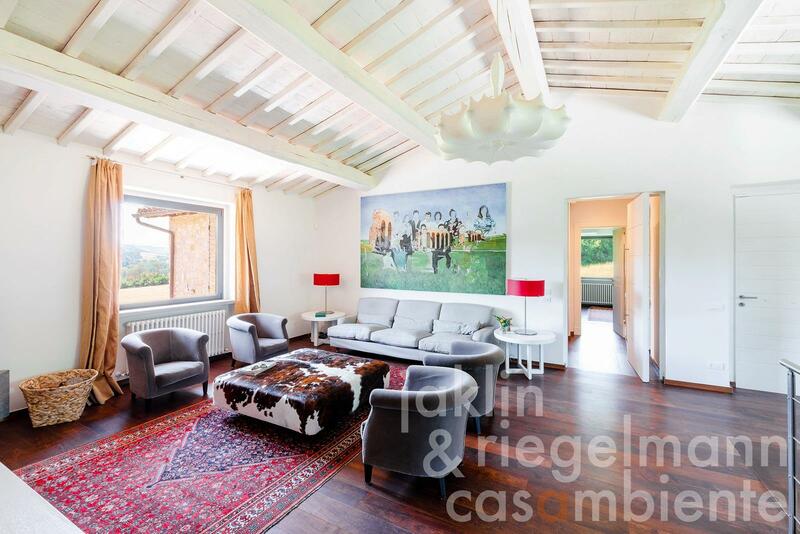 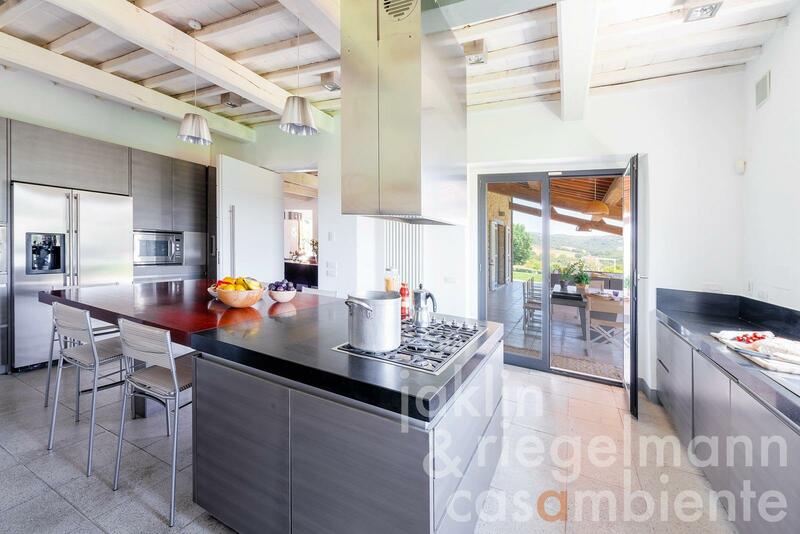 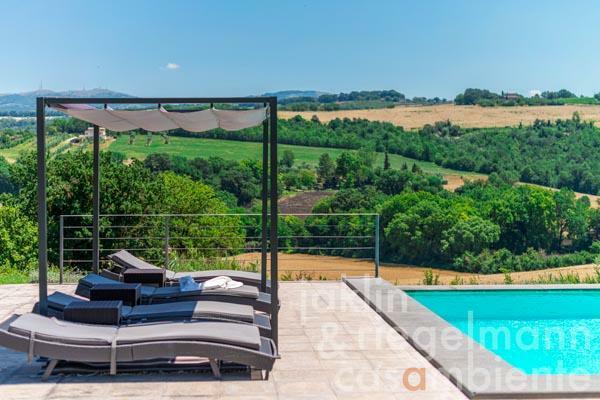 This modern Italian villa for sale ingeniously combines the rustic traditions of an Umbrian country house with a modern New York-style interior. 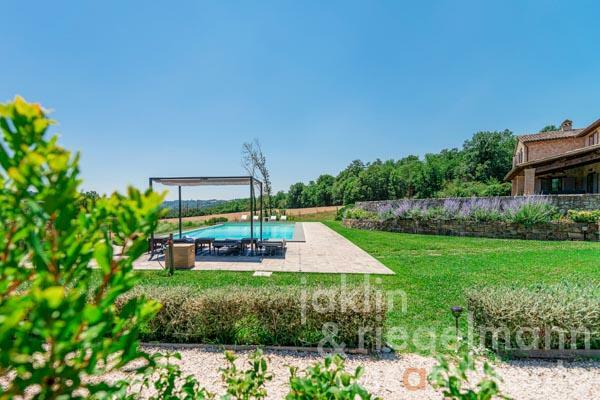 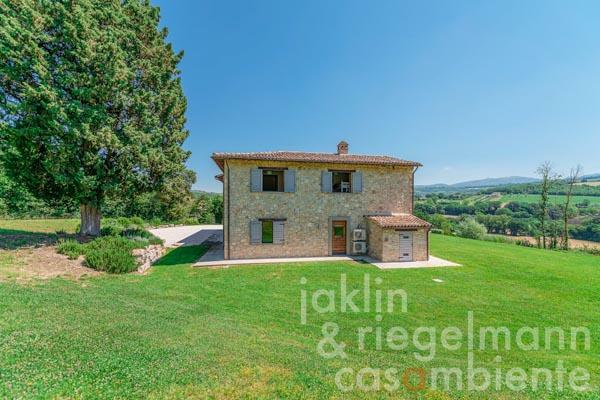 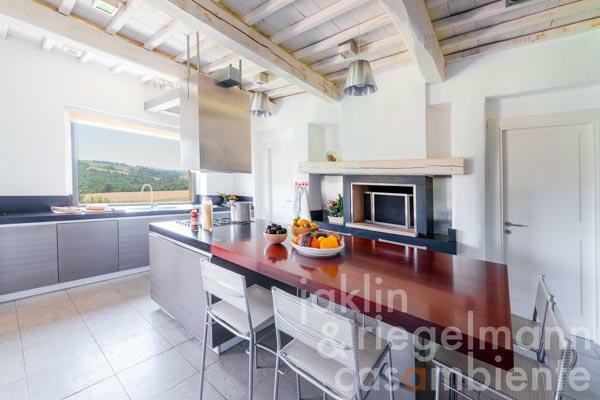 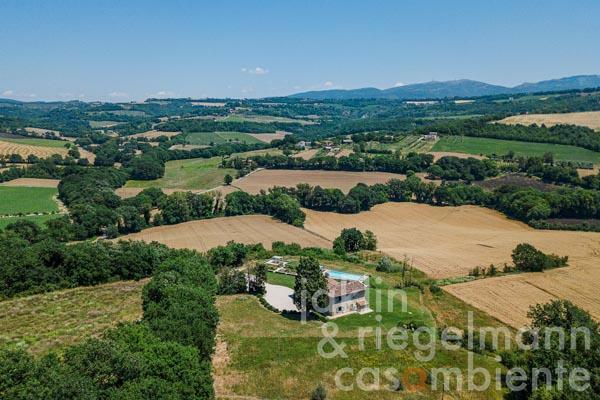 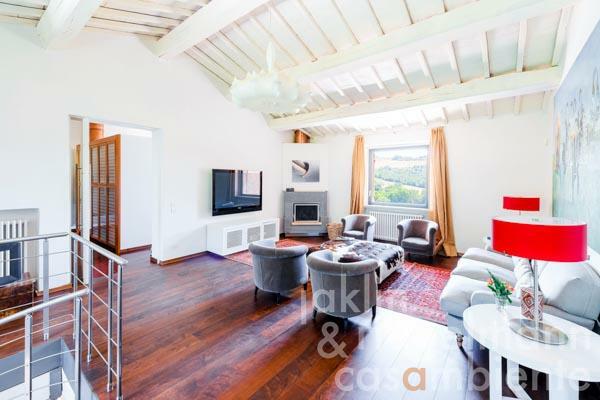 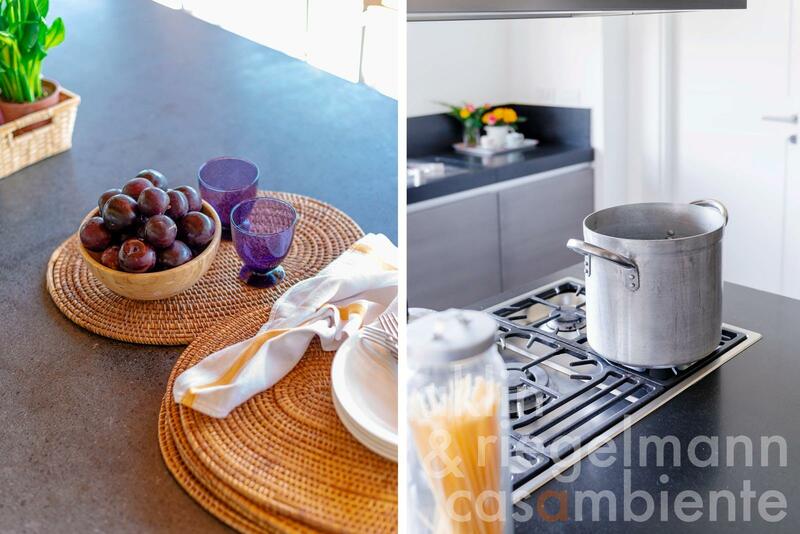 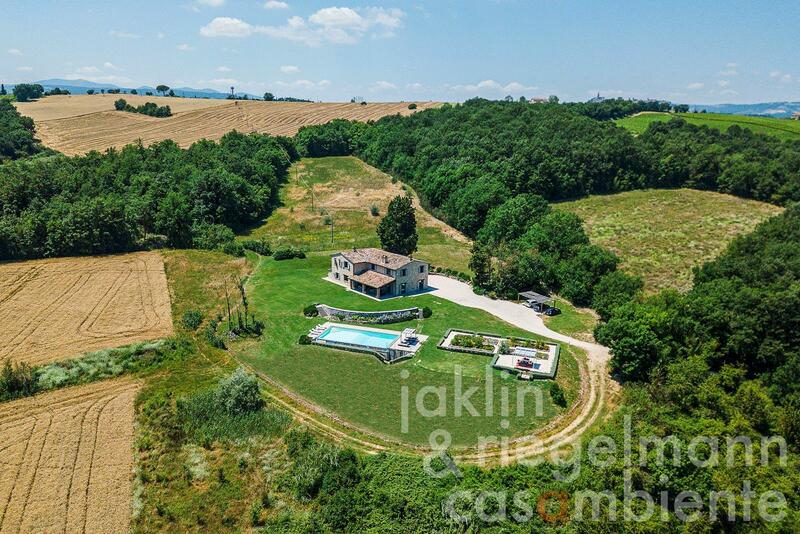 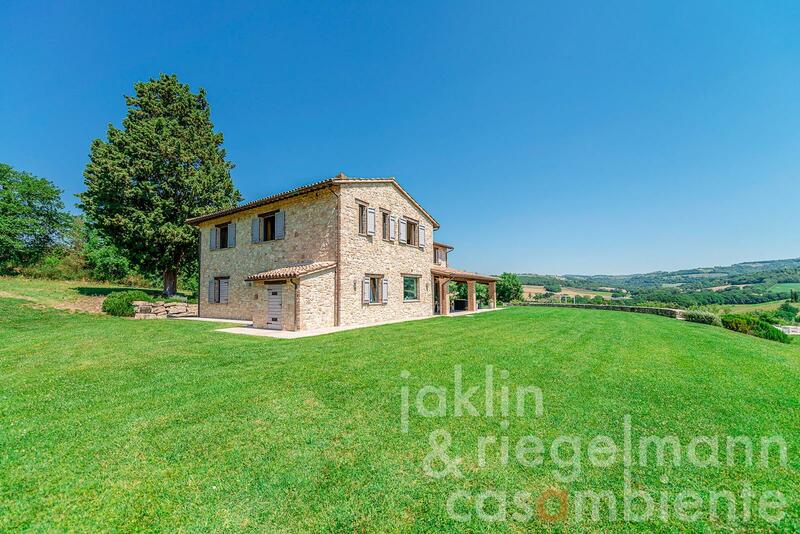 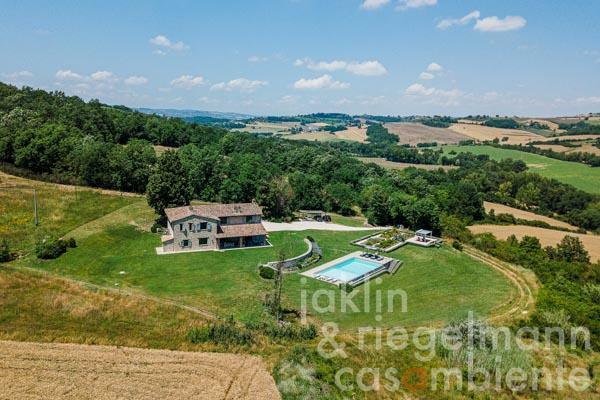 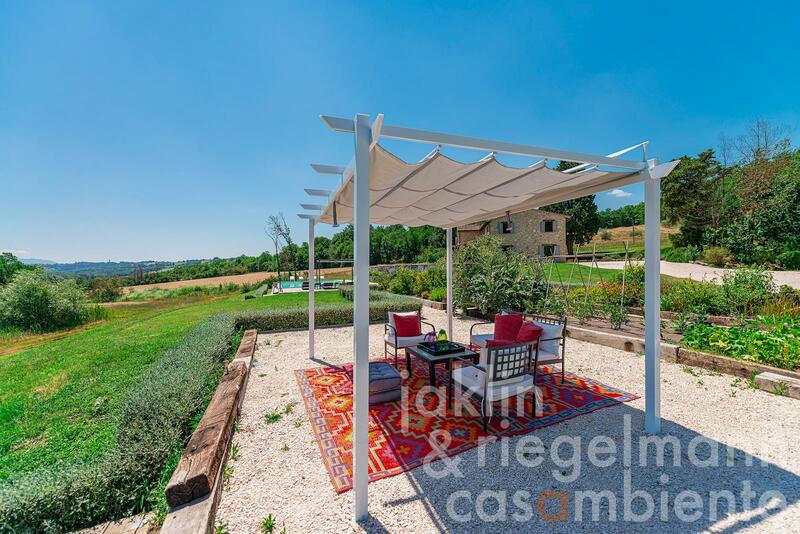 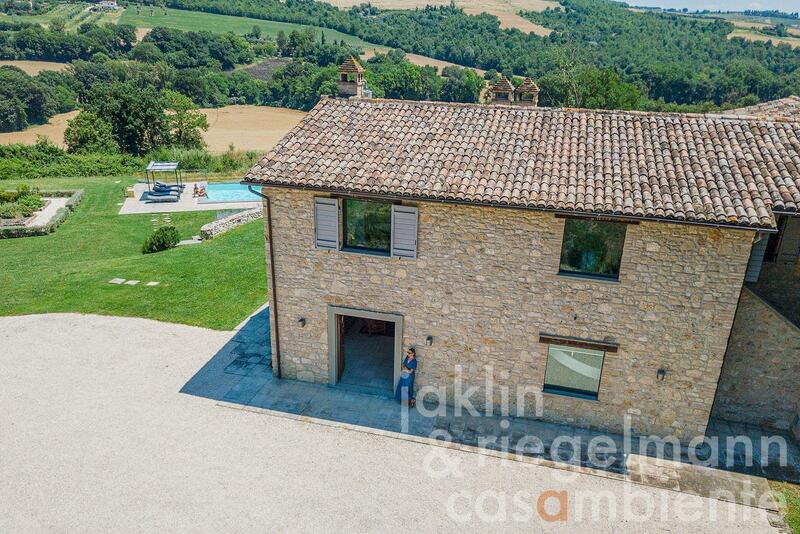 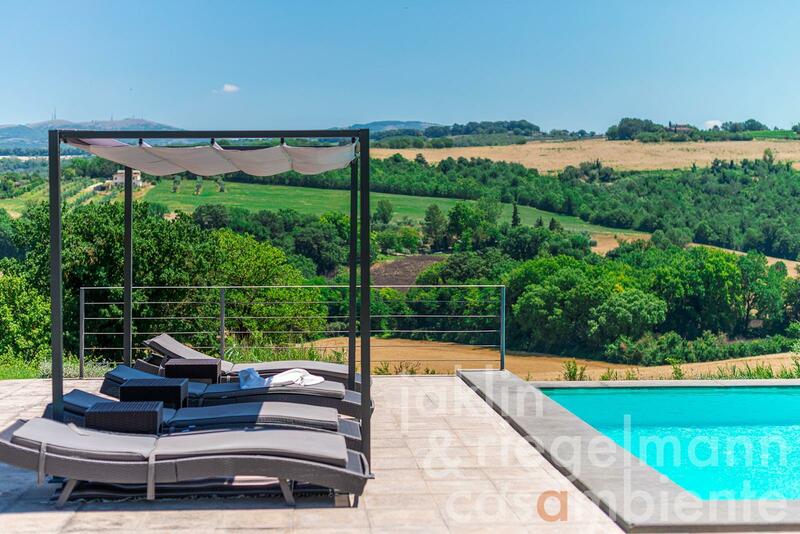 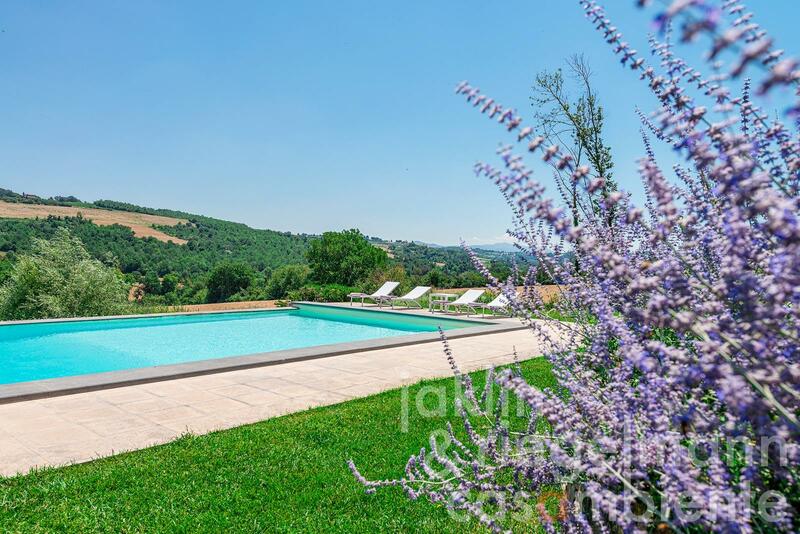 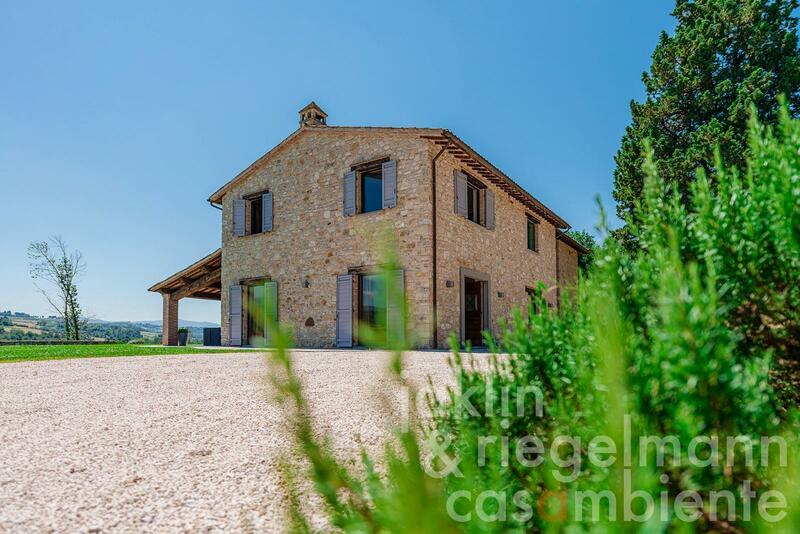 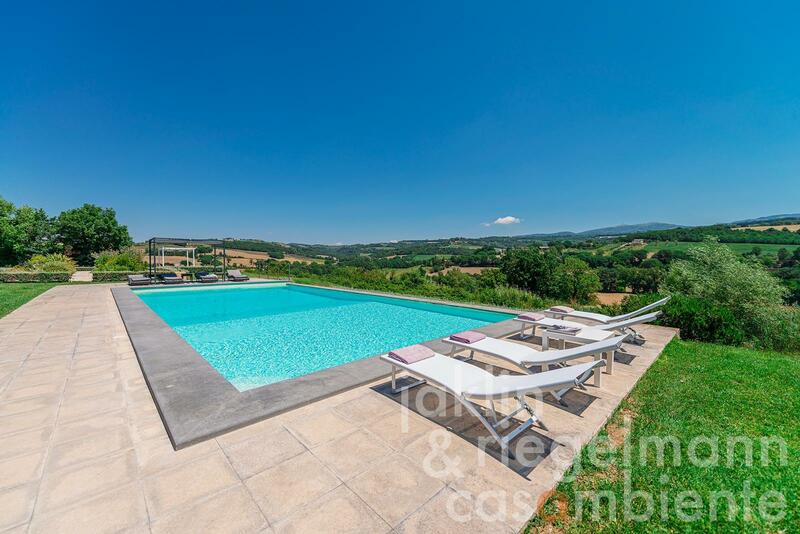 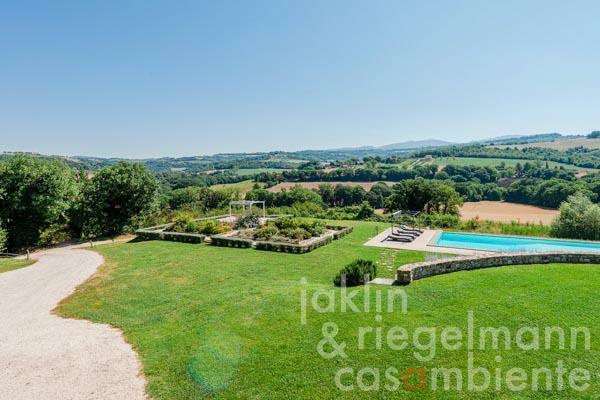 The property is situated near Todi in Umbria and comprises approx. 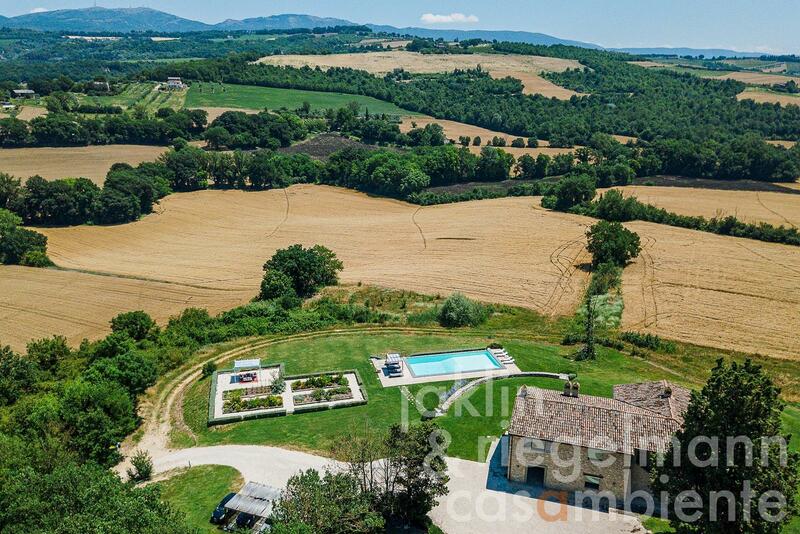 1.9 hectares of land, with well-kept grounds surrounding the house, in which there is a 14 x 7 m infinity pool in a panoramic position. 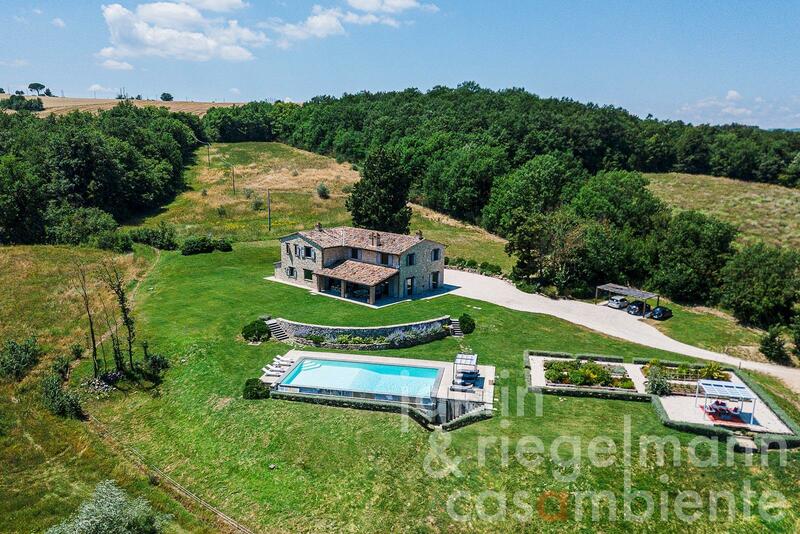 The owners have left an indelible mark of their exacting taste, simultaneously affording luxury and comfort: luxurious marble in the bathrooms, leather floors, a large gleaming modern kitchen with state of the art equipment, all combined to make this property a very special experience in a peaceful countryside setting. 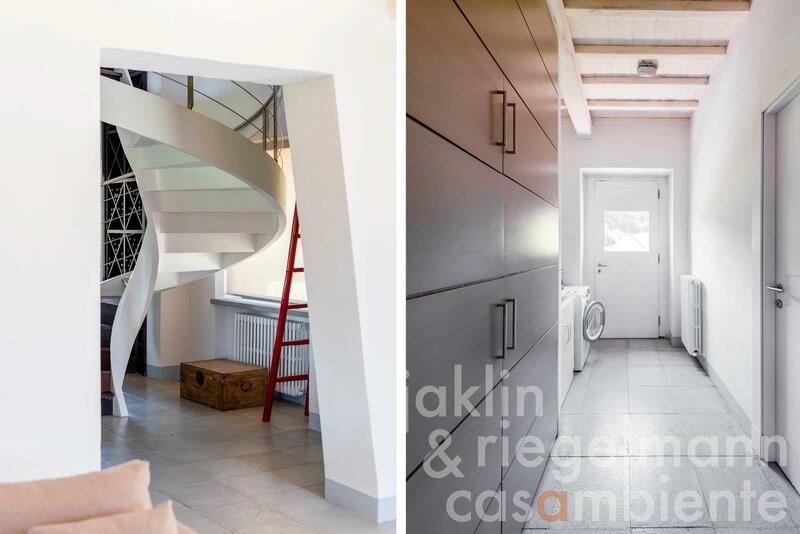 The house is spread over two levels. The living area on the ground floor consists of a dining room, a spacious living/reception room with an open fireplace and a large luxury kitchen and pantry, all with access to the covered terrace. 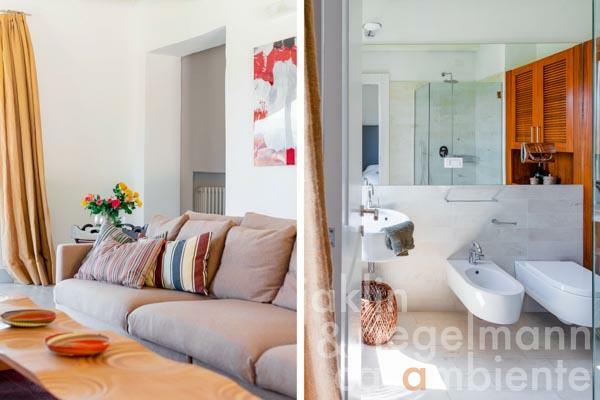 There is furthermore a sitting room, a study (which could both be used as additional bedrooms), a laundry room, two bathrooms and two storage rooms. 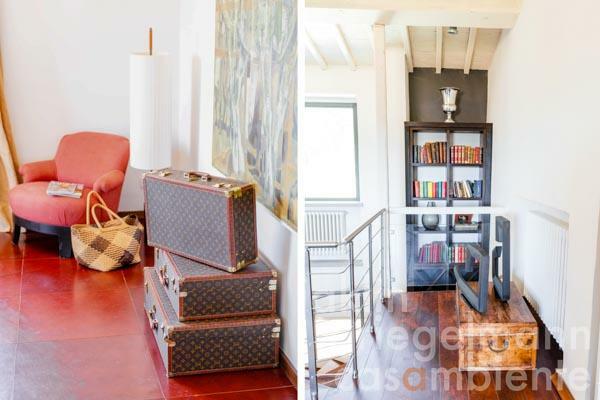 The first floor, accessible via an impressive modern spiral staircase, consists of a large lounge with fireplace, three double bedrooms with en-suite bathroom and a master bedroom with walk-in wardrobe, leather floors and very large private en-suite bathroom with pietra dorata marble throughout. The lounge can also be accessed via an external staircase. 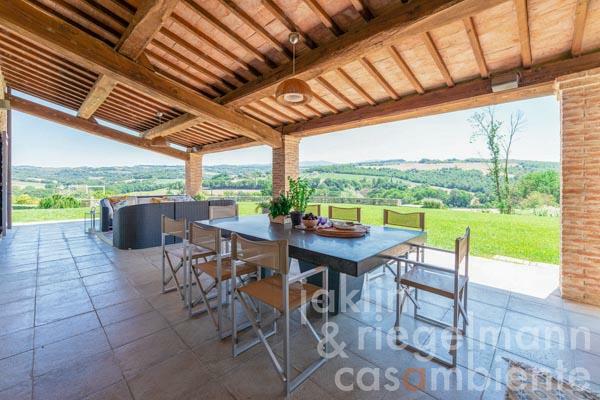 The villa’s location offers panoramic views of the soft rolling hills and valleys of the surrounding countryside. 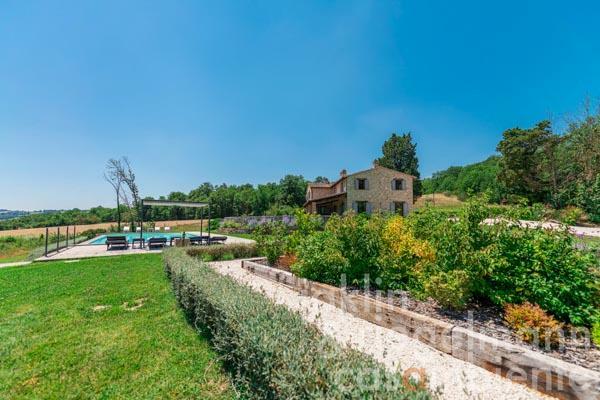 The medieval hill town of Todi, with the main highway, the E45, is only approx. 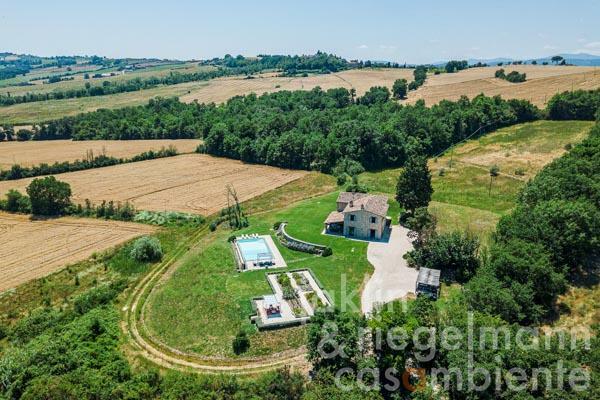 7 minutes from the property. Distances: Todi (all amenities) 4 km, Montefalco 26 km, Orvieto 42 km, Perugia and Assisi 45 km, Lake Trasimeno 53 km, Arezzo 130 km, Rome 130 km, Florence 190 km. Airports: Perugia 46 km, Ancona 151, Rome 161 km, Florence 211 km, Pisa 272 km. 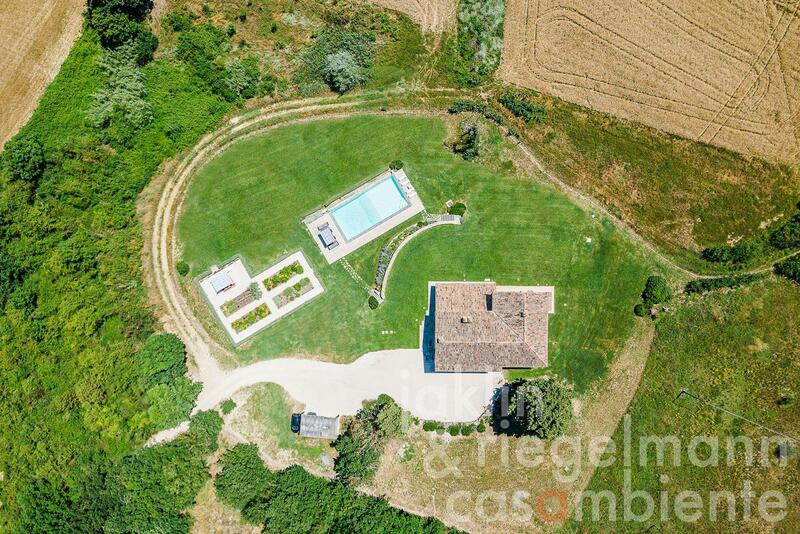 1.90 ha with well-kept garden. 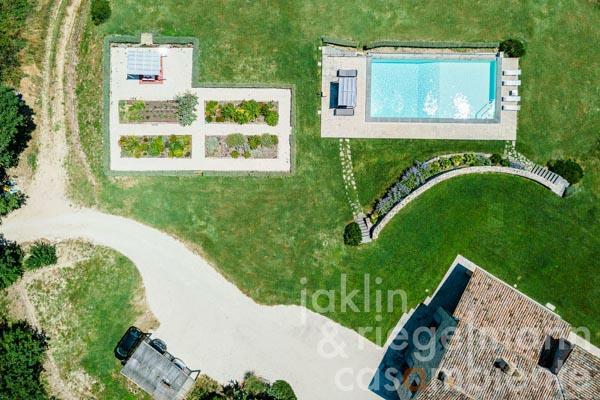 Electricity, own well water, central heating, fireplace, air conditioning, gas tank, telephone, broadband internet access, satellite-TV, alarm system, irrigation system, swimming pool, carport, terrace, garden.